Motorola Droid 3 finally will hit the stores on July 14. But for now, those of you who can’t wait that long, are able to order it from the Verizon’s official web page. The price ranges from 200 dollars to 460 dollars, Yahoo news reports. Motorola Droid 3 is now available on the Verizon official web page. For the clients who are ready to sign a contract of 2 years, the phone will be available at a price of 199 dollars. For those who don’t want to be tied to the company through a contract, the phone can be bought for a bit more than double: 459.9 dollars. 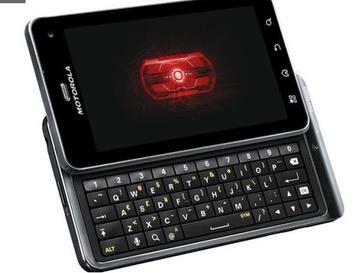 The differences between the new Motorola Droid and the Motorola Droid 2 model are the wider screen and the fact that the new model has a fifth row of number incorporated in the keyboard. It also has 26% more pixels on its touchscreen. The Droid 3 smart phone is accessorized with front and rear cameras. The rear camera is of 8 megapixels. Its thickness makes it the thinnest smartphone. It runs on CDMA and GSM networks, but some of the Droid fans might be disappointed in the fact that it does not run on the faster 4G LTE network. In the official statement of the launching of Motorola Droid 3, Verizon described the device as “enterprise-ready”, outlining that the smartphone has both device and SD card encryption and supports the use of complex passwords. Only 512 meg of ram. No LTE. No Droid 3. A dinosaur on day one. Shame on Motorola and Verizon. I’ve owned a droid from day one, but this is how I feel about Droid 3. I’m expecting my D3 Tuesday, yay! A majority of the country has no use for 4G, so who really cares? Selling my X after D3 arrives, and I’m still glad I sold my iPhone 4. Horrible. Terrible. I have been waiting for this phone for months and what do they do? qHD and a dual-core with a front facing camera, a keyboard, AND NO 4G?! We’re supposed to be upgrading not moving laterally. Screw that I might as well stick to my Droid X until they come out with D4 that HAS 4G. What a disappointment.